So I've been at it again creating another look - this is actually a bit of a go-to look for me which is why I thought I'd share it. It's what I'd consider to be a very wearable green look. There's 2 reasons I think it's super wearable, firstly because the liquid liner is only on the eye lid and not under the eye, and because it's not too dark in colour. Once again, as with any look you do, or I do, it's all about blending, and adding little bits of colour and building on it. Urban Decay Vice 2 palette, Maybelline quad in Spiced Cinnamon, Makeup Revolution kohl* & flick liner, Revlon bold lacquer mascara, Urban Decay primer potion in eden, and Benefit Browzings & Gimme Brow. 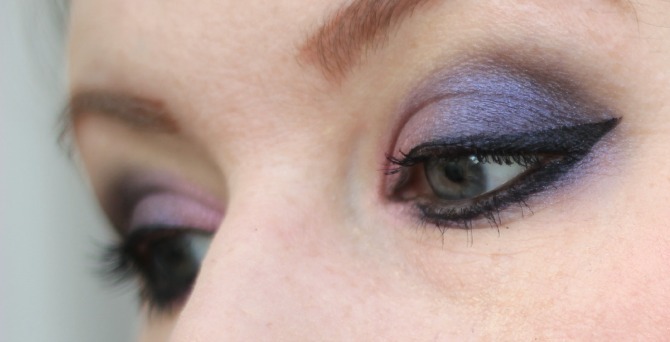 After you've filled in your brows, prime your lid with your eye shadow primer (for me, this was the UD primer potion in eden). Then take the Maybelline Smoky Cinnamon quad, and apply the lime green colour to the inner third of the lid by patting it on. 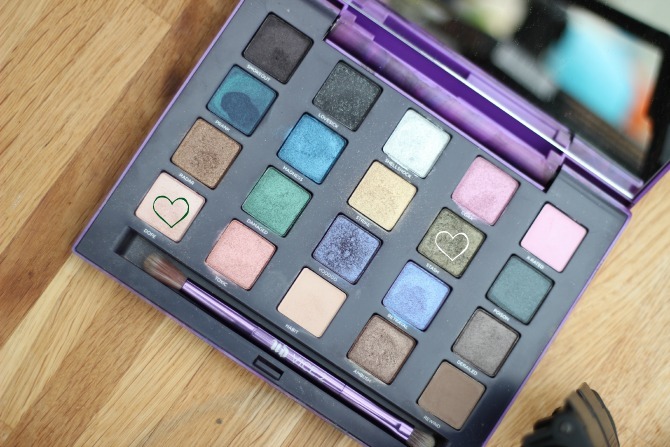 Then, go to the Vice 2 palette and the shade 'Stash' it's a mossy green colour that's quite flakey. Pat this on the rest of the lid. Then take a clean blending brush and blend it all in including the edges. 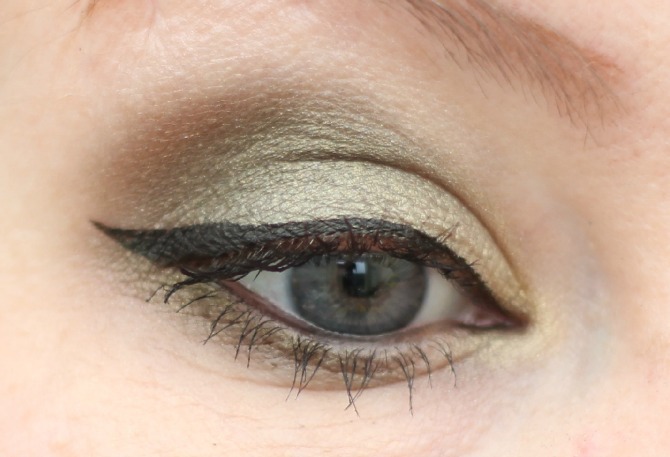 Once you've done that, go back to the Maybelline quad and go to the dark green shade with a fluffy blending brush (I used the one in the Vice 2 palette) and blend it through the crease and outer V. Once you've done that, take the cinnamon shade in the Maybelline quad, and blend a small amount on the outer edge of the green (like in my pic) just to give the look at little warmth. 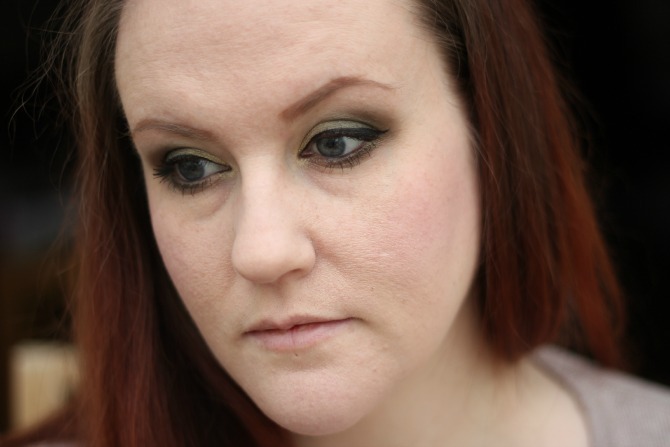 I then took the dark green from the Maybelline quad and blended it under the waterline. Added some kohl liner to my waterline, liquid liner to the base of my lashes with a cat-eye flick and 2 coats of mascara. Oh and before I forget, I added a highlight just under the brow bone, this was the shade 'Dope' from the Vice 2 palette. I've seen New CID reviewed on quite a few people's blogs over the last year or so, needless to say, it had piqued my interest. Let me introduce you to their foundation called, i-perfection. It comes in a chrome-look bottle with a pump dispenser. The geniuses there realised that you'd never be able to tell how low you were running on foundation, so they included a see-through strip down the side of the container (pictured above) so you can see how much is left, love it! I bravely went for the shade 'latte', I'd normally go for the palest shade since I'm so fair, but when I looked at the swatches online, I could see the 2nd lightest shade was more yellow toned, whereas the lightest one was pink toned, and since I'm more yellow toned, I thought this would be a better match, and you know what? It was a perfect match! I almost don't need to blend it along my jawline, well, I don't need to for colour, just so there's not a clear mark where it transitions. 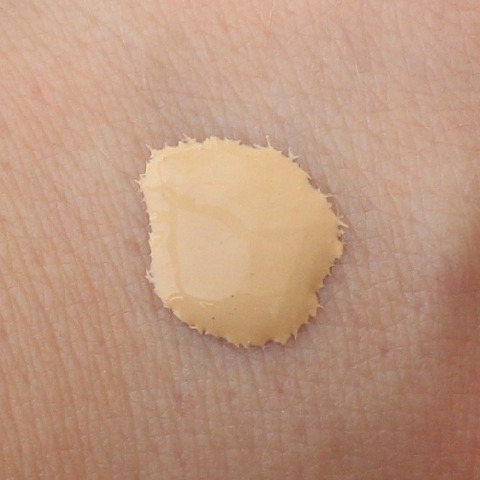 After wearing this, I'd say it's probably best suited to people who don't have any dry skin, I have a little dry patch on my one cheek and it does highlight that a little, not as much as some foundations, but a little. It sets really well and very quickly - and only after about 8 hours does it go a bit shiny for me, but after blotting it's good again. 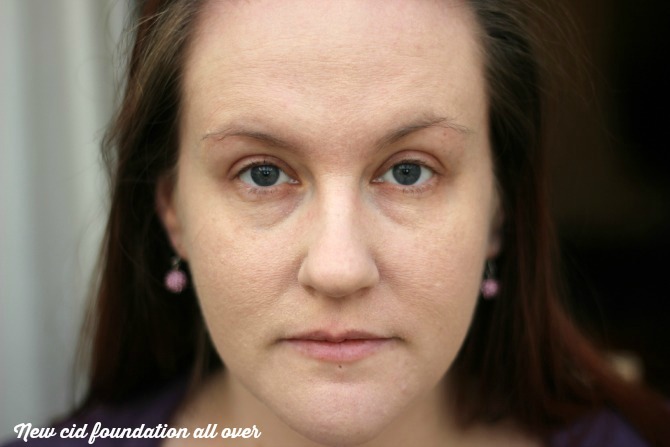 It's quite a light-weight foundation, so if you're looking for heavy coverage, this probably isn't for you, personally I much prefer lighter foundations. It's one of the more pricey foundations in my collection, coming in at £28.50, for that you get the standard 30ml of product. In all honesty, as much as I like this, it's a decent foundation and sits nicely on my skin, but I probably wouldn't replace it when it runs out. Not because there's anything wrong with it, but because I have other foundations I prefer - such as the Chanel Vitalumiere Velvet foundation (very similar to this), it's a little more expensive, but has a much nicer finish, in fact, it's my favourite foundation, next to the Makeup Forever HD foundation. 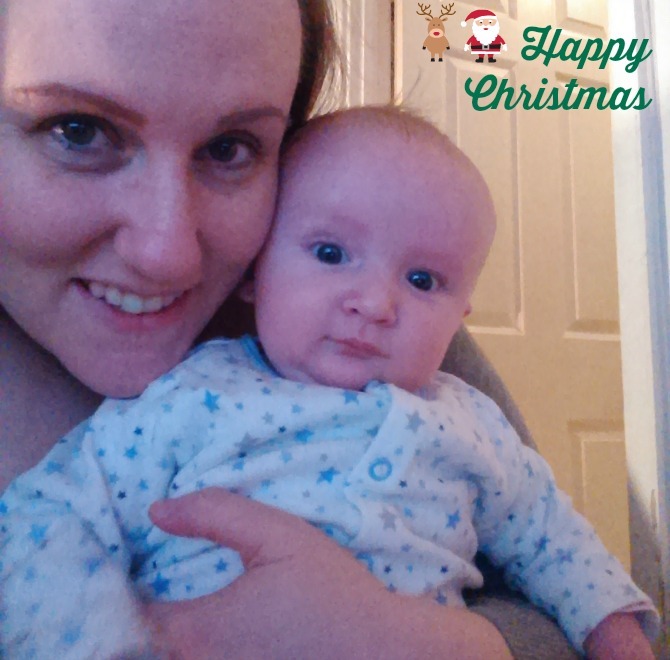 I just wanted to say a big Happy Christmas to all of you, from Squidge and I :) Thank you so much for your support over the last year, and coming with me on the rollercoaster that has been 2014. I hope you all have an amazing day and that you manage to spend it with loved ones, whether friends or family. These come in 4 different flavours (pictured) each aimed at being a mixer for a different spirit, such as raspberry & orris for vodka, cucumber & apple for gin, pear, spice & lime for rum, and then ginger & lemongrass for bourbon (mmmmmmm). I've yet to try these as I don't have any spirits in the house at the moment and I'm still not drinking after having a baby, however, I will be taking them with me to the in-laws for Christmas day :) Oh, and these have caffeine in them (think Red Bull) and they're sugar-free. 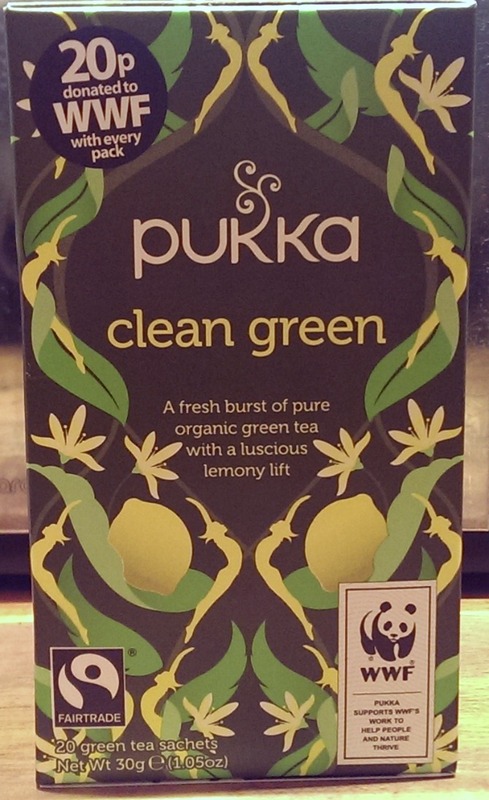 I'm a big fan of green tea, especially when it's married with lemon, it's like they were meant to go together! This particular brand have combined fair-trade green tea, with scicillian lemons and dandelion root. Since I've been on maternity, and since I've been trying to save money, I've gotten back into porridge (made with milk of course!). I'm quite keen to try this as it's porridge with the added health benefit of chia seeds and coconut oil. It's a 'just add water' pack, so simple to make. 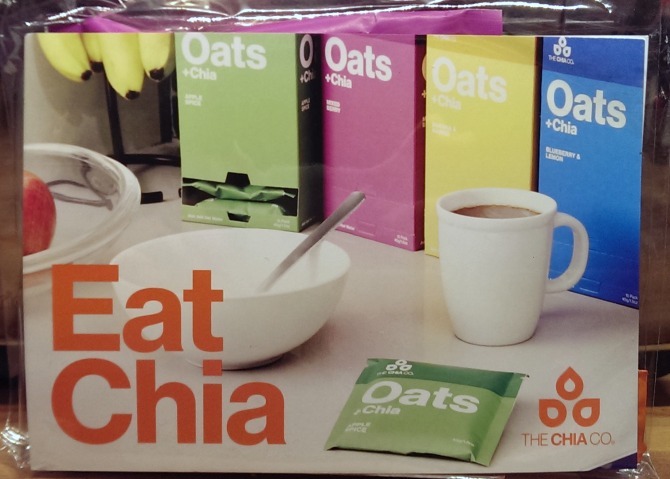 Chia seeds are a great source of protein (something I lack being a veggie), fibre and omega-3. I think most bloggers have had these whether in a goody bag or bought a pack themselves. 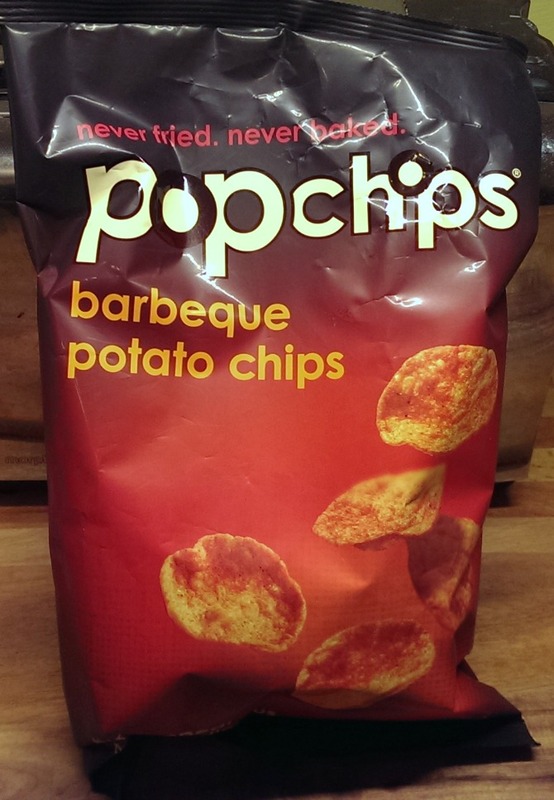 They're heat-popped crisps that have a lot less calories than normal crisps, thanks to how they're cooked (not fried or baked). 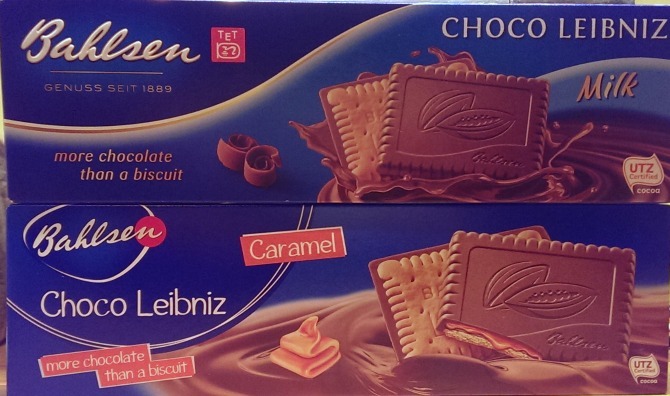 They have a great amount of flavouring on them too, and are super-duper moreish - these were demolished for breakfast the next morning. Perfect for breastfeeding mummies or designated drivers (or even people on a diet). 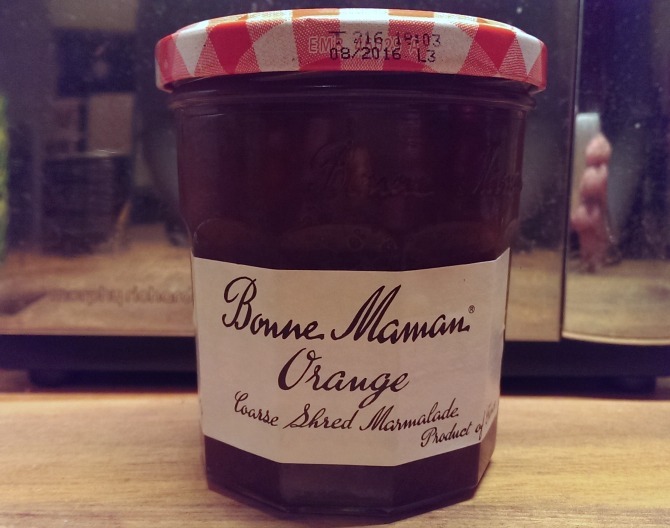 I haven't tried this yet, so can't comment on it, but it is in my fridge waiting to be had! 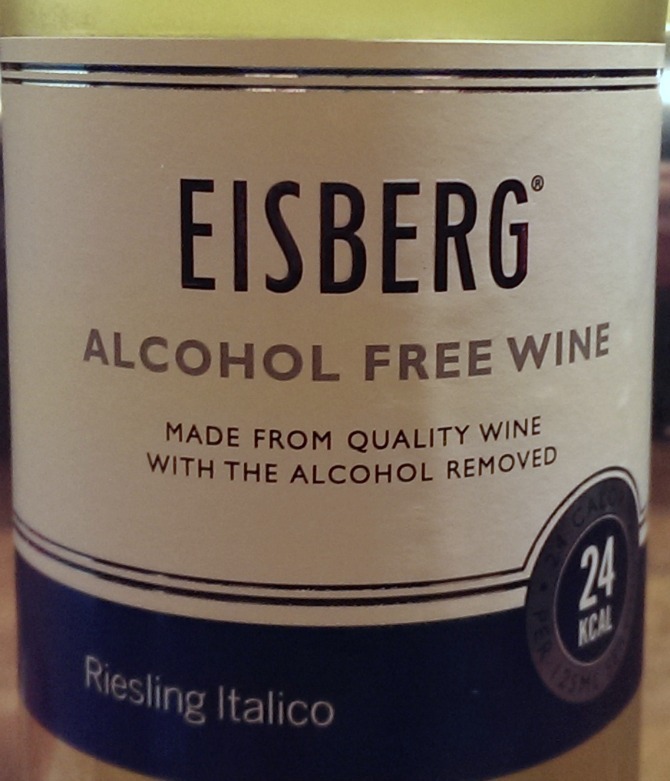 It's made in exactly the same way as normal wine, but has the alcohol removed - it's available in chardonnay, rose, cabernet sauvignon and riesling. 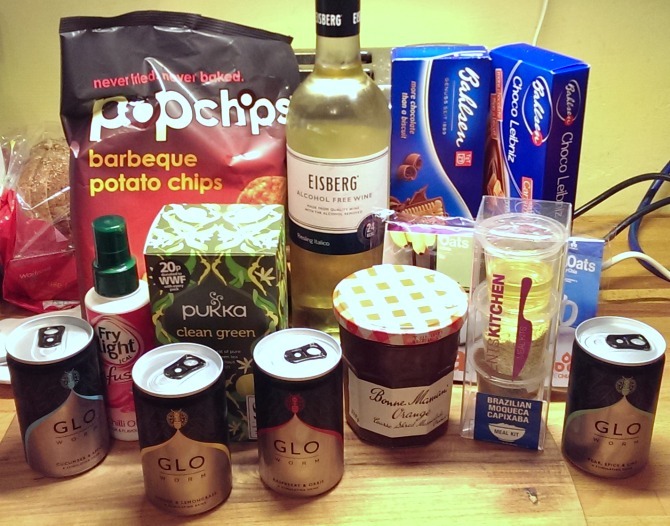 This has been a great box, for me the biscuits, popchips, green tea, marmalade and gloworm mixers were the highlights. 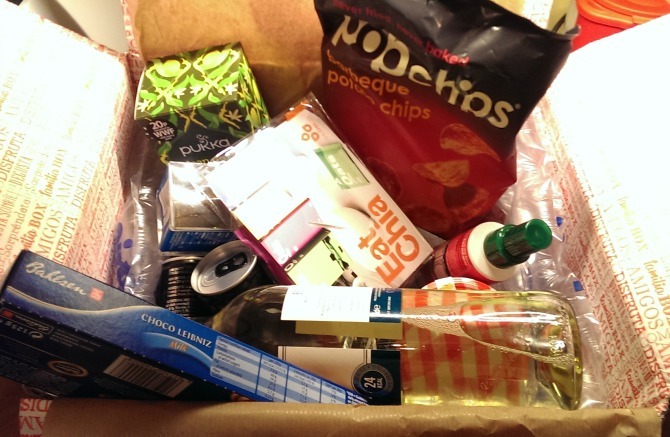 It's £12.99 a month which is quite reasonable (on par with beauty boxes) and for you lovely peeps, they've given me a discount code for £3 off your first box :) Here's the code: AC0QX. Looking for a last minute present for your wife, girlfriend, mum, nan? 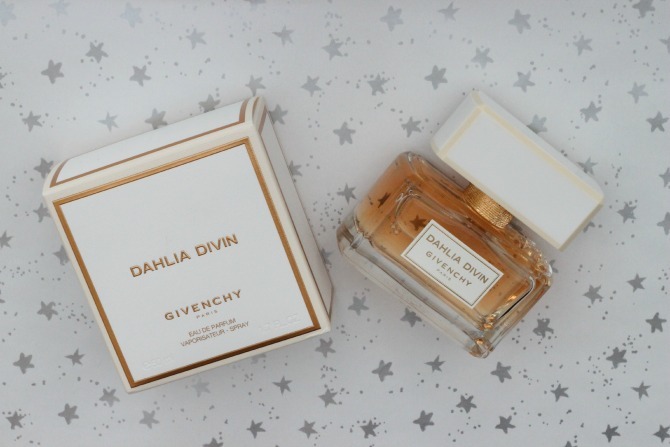 Givenchy have released this 'sophisticated' scent that changes and develops as you wear it which would make a lovely gift. 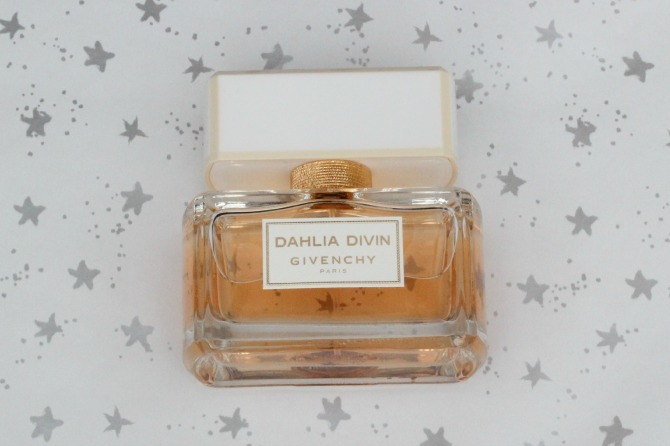 The packaging for this is beautiful, it comes in a rectangular glass bottle, with a rectangular lid that has a soft yellowy-gold edge. The perfume itself is a sort of amber colour. When I first smelled this, my first thought was that it was a bit of a mumsy scent, however after spraying it and wearing it my mind was changed, it's not mumsy, it's 'sophisticated' and 'elegant' - I think anyone could pull this off. 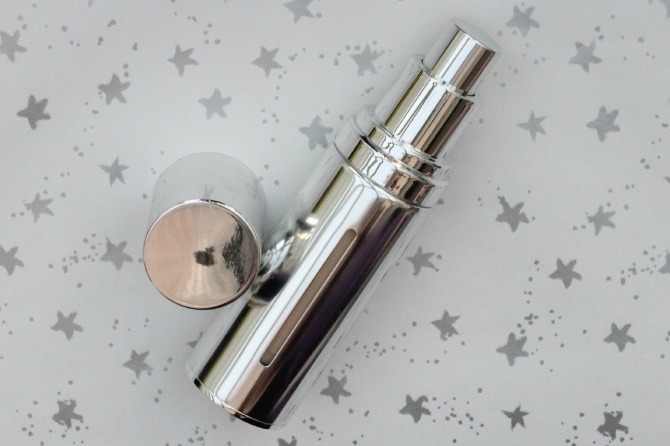 It's also available in a gift set with 50ml of perfume, and a 12.5ml travel spray, all for the same price as the stand alone 50ml bottle :) You can pick it up here. 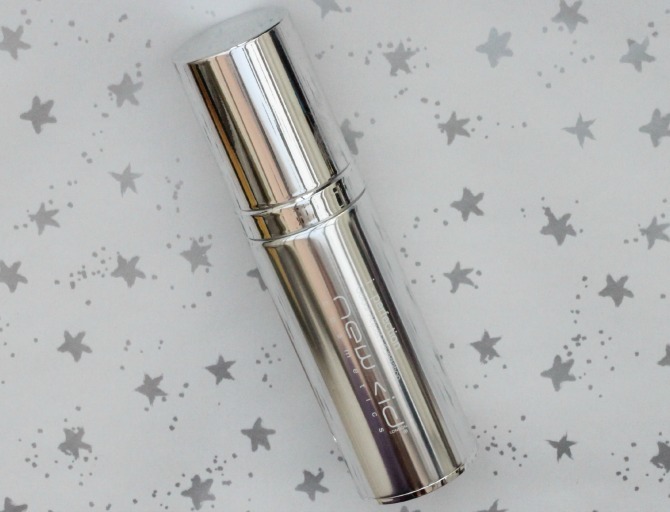 Prime - I primed my eyelids with the Urban Decay Eden primer potion - I used this one as I have a lot of redness and blueness around my eyes at the moment due to the lack of sleep, and this evens it out creating a nice base for the shadow. Brows - I used the Benefit Browzings( and Gimme Brow( to shape and define my brows, to frame the look. 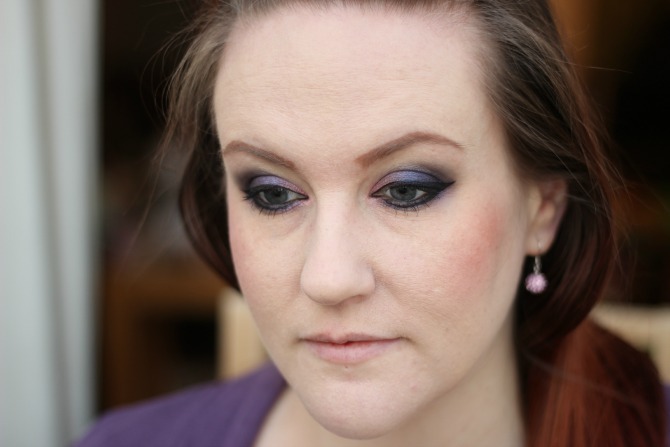 The shadow - I started with the pink shimmery shade called 'coax' from the Urban Decay Vice 2 palette (any similar shade will do) and patted that on the inner third of my eye. Then I dabbed Betrayal on the middle of the lid (from the same palette) pulling it to the edge of the lid. Then I worked through the glittery black shade 'Lovesick' through the crease, focussing on the outer edge to make it smoky. 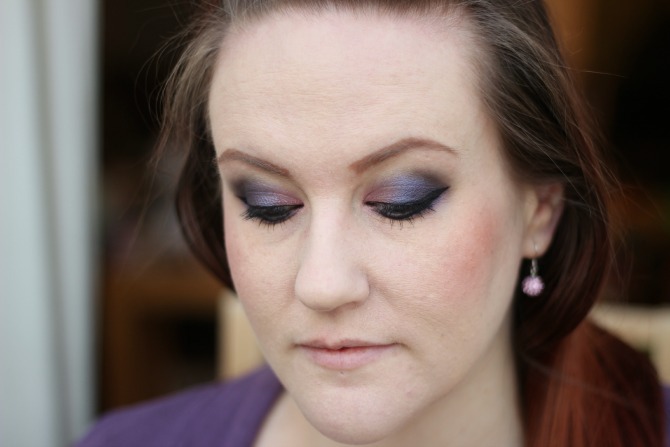 Next up from the Makeup Revolution 'Give them Nightmares' palette*, I opted for the dark purple shade (pictured above with a heart on it) and dabbed that on the outer third of the lid. Once that was all in place, I took a blending brush and blended it all in, adding extra colour for depth where needed. I also took these 3 shades under the eye in the exact same order. Liner - I used the Makeup Revolution Kohl & Flick liner* - the kohl on the waterline, and the liquid liner for the rest, creating a cat eye flick. To finish this off and take the edge off the sharpness, go back to the sparkly black shade in the Vice 2 palette 'Lovesick' (honestly, every time I write that word, I go to write Lovestick - something very different, lol) and blend it in on the liner with a small but fluffy brush. Tip - when creating this look less eye shadow is more, it's much easier to add more shadow to the look if needed than take away, and blend, blend, blend! What do you think of this look? Would you wear it? What colour look would you like me to do next? Green? Blue? You'll need to pick up a few supplies but it'll be much cheaper than paying for expensive treatments at a spa. It'll also be much more convenient as you won't have to hop in the car and make a trip in order to be pampered. Pick up an oil burner and the essential oil bergamot. This oil stems from a citrus fruit and is often used in aromatherapy, massage oils and perfumes. When the burner fills your spa space with the tiny droplets of bergamot oil, you should feel considerably better right away. Essential oil improves your mood by decreasing your blood pressure and heart rate. It's a natural stress reliever as the burner allows the therapeutic droplets to be gradually absorbed by your skin. When essential oil seeps into your body, it travels to the limbic system and communicates with the brain, telling it to relax. Bergamot oil can also be used to create a soothing bath. Add 5 to 10 drops of the oil to your bath water and hop on in. You'll soon find that your stress has disappeared as the essential oil is absorbed through your skin and inhaled through your nostrils. If you only have regular bath oils, go ahead and mix those into your warm bath water and soak in there for 10 to 20 minutes. Combine a cup of sweet almond oil with a half-cup of sesame and a sprinkling of sweet orange essential oil. A couple drops of lavender can also be mixed in. Massage this oil deeply into your follicles and then wrap your hair in a turban. Let your hair collect the moisture from the oil treatment for as long as possible before rinsing and proceeding to engage in your normal hair care routine of shampooing and conditioning. You won't have to go to the spa to cleanse your skin. You can do it right at home with your bergamot oil. Just add 5 drops to some steaming water in a bowl. Then put a towel over your head and the bowl to collect the steam. Inhale deeply over and over for a few minutes. The bergamot will decrease your skin's potential for outbreaks and also lessen those that are already afflicting your skin. Your skin will also benefit from bergamot oil when it is added directly to your lotion. Sprinkle in a few drops into unscented vitamin E cream to create an enhanced dry skin lotion. This combination can also function as a fantastic massage oil. You can learn more techniques and secrets like these from enrolling in an esthetics program. You can also give yourself an at home facial in your makeshift spa. Start out with a light steam. Place herbs into a teapot, add boiling water and let it sit for a couple minutes so that the herbal components can seep into the water. If you are looking for herb ideas, consider mint, lavender flowers, parsley, rose petals and lemongrass. Then pour this herbal infusion into the sink while adding hot water. Place a towel on your head and lean over the steaming infusion. Keep your face just above it for 5 full minutes. This will clear your pores and smooth out your skin. 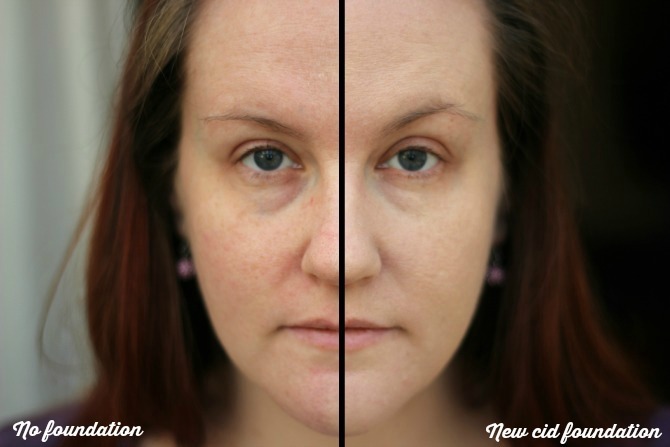 Then apply a facial cleanser and lean back over your steaming infusion for another full minute. It'll eliminate impurities while unclogging oil and debris. Just fill up a spray bottle with water, add a dash of milk and a couple drops of rose and lavender essential oils. Exfoliate and apply a mask that meets your skin's needs. Lay back and put your mind at ease as your mask works its magic. You can also soak cotton pads in green tea and place them over your eyes to eliminate puffiness. Finally, add an organic moisturiser with active ingredients to complete your DIY facial. Performing your own massage at home is easier than you think. Combine 10 drops of essential oils with two cups of sweet almond oil. Apply this mixture all over your body, starting at the bottoms of your feet and moving upwards. Apply the oil mixture with long and smooth strokes to massage the stress away. Once you've massaged the oil onto your entire body, wrap yourself in a couple towels to ensure that the oils are fully absorbed. *This article was written in collaboration with the Cosmetology & Spa Academy. 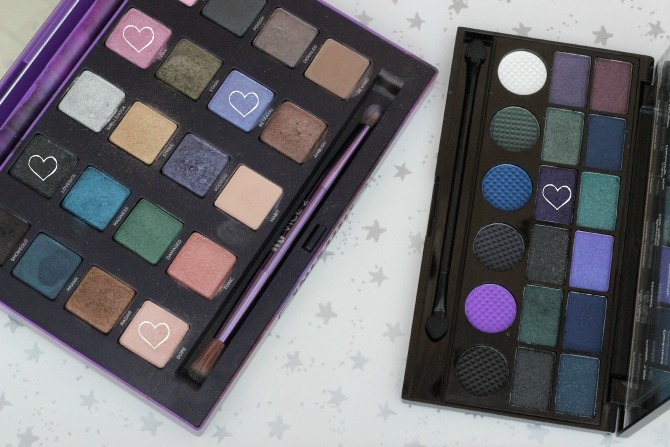 The lovely people over Makeup Revolution have been at it, AGAIN! Honestly, I can't keep up with all the new things they release, and what I can't get over is how what they do release is really good quality - how do they do it? Anyway, I digress, they've released some lovely blusher and bronzer palettes, and while I haven't given them a good road test yet, I thought I'd let you know about them, and show you some swatches. This 8-shade palette has a combination of matte and shimmer shades, and the two on the far right, I'd suggest using as highlighters (the top right one is stunning - whereas for me, the bottom right one is more of an inner corner of the eye highlight). 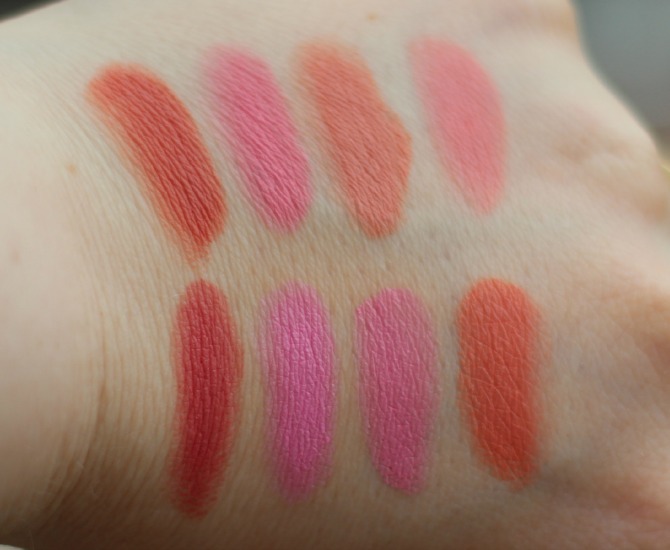 The pigmentation on them is really good and with a nice variety of pinks. 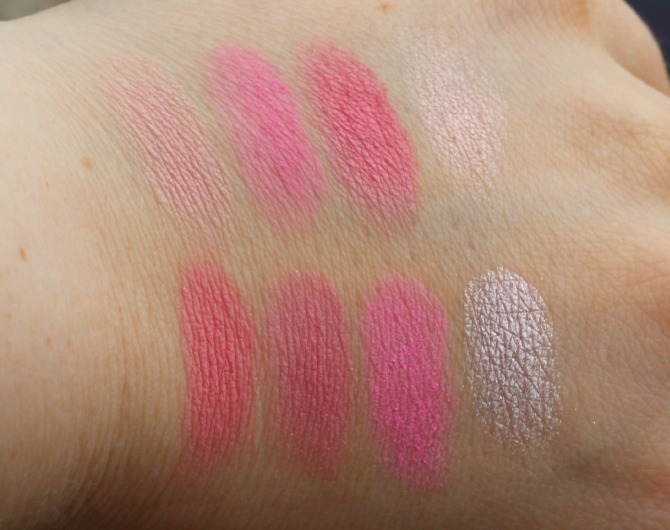 The shade 2nd from the left on the bottom row is the only glittery/sparkly shade in the pinks (not including the highlight shades on the far right). Now this one is a special palette, featuring all cream blushers, no highlights, just a wide range of cream blushers. 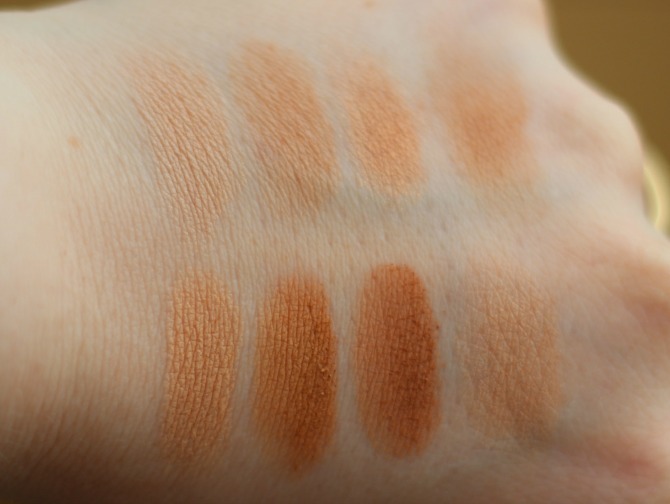 What I loved when I swatched these was the consistency, they're really buttery but not greasy. 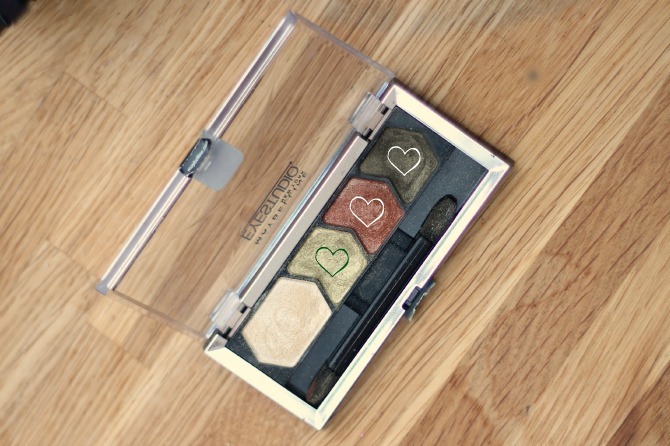 They're very, very well pigmented and appeared to blend really well. I love the range of colours included too, from deep corals to light candy pinks. So there you have it, more new releases from Makeup Revolution - each of these you can pick up on their website, or in a Superdrug that stocks them, for £6* each - great value for 8 blushers/bronzers that are really decent quality. This month The Body Shop are doing a fantastic collaboration with bloggers in the form of a blogger review advent calendar! 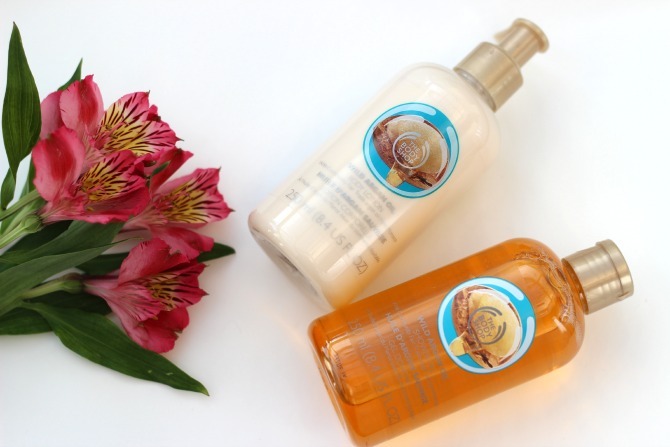 Today is my turn, and I'm featuring their Wild Argan shower products. Have a look at the calendar to see what other bloggers have reviewed in the lead up to Christmas. The Body Shop shower ranges are famous. Regularly releasing new limited edition scents and additions to their permanent lines, one of my favourites being the blueberry range from Winter 2013 (the Raspberry range is the closest replacement to this). 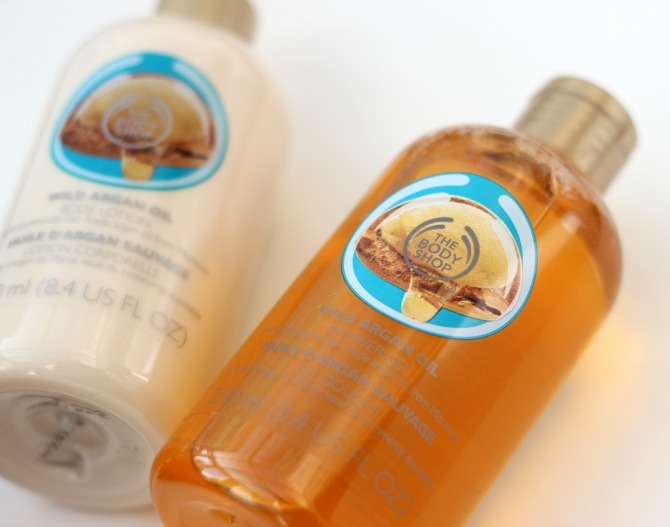 This is their wild argan oil range, full of the benefits of the argan plant and everything you'd expect from the Body Shop. They have a whole suite of products including a scrub, body butter, lip balm, bath bubbles and even a lovely blue body buffer. The scent is different to what I expected, I'm not sure what I thought I'd be like, but it's a lovely honey-type scent, a warm soft but sweet scent. Pretty much every time I step out of the shower after using this I get a compliment about the scent. The shower gel lathers up really well and leaves your skin smelling great and refreshingly clean. The body lotion is soft, hydrating, non-greasy and quick to absorb. It comes with a pump dispenser which is great so you don't end up getting lotioned-up-hands all over the bottle, and you don't dispense too much product. Argan oil comes from the argan tree which is typically home to Morocco. In it's native country it's used for hair care, skincare and even in makeup like kohl eye liners. When used in skincare, it can help with redness on the skin and acne, having a calming effect on the skin. I'm a big fan of The Body Shop, I love that their products aren't tested on animals and that they contain decent ingredients. Their body butters are fantastic (their fruity ones are my favourites - Satsuma, Raspberry, Blueberry, Strawberry) and always a staple in my bathroom. The next thing on my list to try is the Wild Argan body scrub since my current one is about to run out. What's your favourite Body Shop treat?